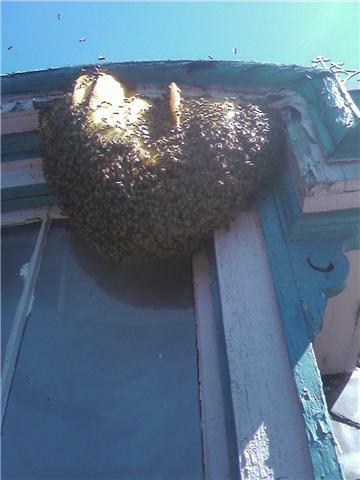 Gleanings from 2009 – Bee brave. Bee a leader. For a year without tomatoes, I’ve had some of the best tomatoes of my life (from out of state). Some great seeds were saved in a tough year. Who says you have to do better each year, all the time? That doesn’t sound sustainable. Reports coming in show that this year has had the worst honey production in US history. No one can remember a leaner time. The Hudson Valley led the way with record breaking rainfall. I think there were four dry days in June. July was hardly any better. With so much surface water, plants did not have the need to send roots very deep. Even when the sun came out, the nectar just wasn’t there. I am thankful for the rain. Yes, that’s right. The terrible stress and depression of watching so many bees go hungry has abated as the season nears its end. The communities I live in have helped me through it. I harvested no honey and did feed 1200 pounds of sugar, just taking the edge of hunger off of the 300-some top bar hives. I do not like to feed bees - consider how the ph balance is alterered to favor disease (the real killer of hives, not the varroa mite). 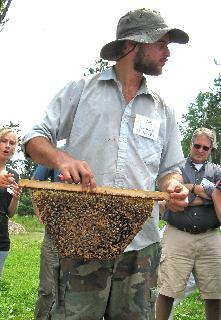 Feeding bees as a general practive lets them grow to depend on it. This year, however, feeding was necessary to keep a core population alive. Several still will not make it, some will go south, but the remaining core population will be robust and stronger for surviving a tough season. The bees will be OK, and next years queens will carry on these tested genetics. The more bees die, the more they live. We are always safe. We had many great events this year. 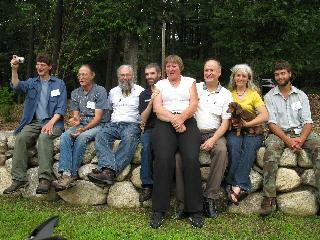 Another fantastic Beekeepers Association of Northern Dutchess (B.A.N.D.) annual potluck and several other field days and meetings full of laughter. We had the first Northeast Treatment Free Beekeeping Conference, which was a huge success, and the second one in the southwest hosted by Dee Lusby. I was able to spend some time this year out with Dee’s bees, whom she visits not 5-6 times a year- a truly less-invasive beekeeping. Some splits were made to replace dead hives, but in some locations where all hives were seen flying, Dee would call out, “Everyone back in the truck!” and we were off to the next yard, not even taking a peak in the boxes, and not to return for another few weeks or months. Just let em swarm or fail. Why not? I was impressed. I hold on to commercial habits of control, needing to SEE, needing to split the bees before they split themselves. The results are not negative per se: this year I wound up with having a lot of hungry mouths to feed rather than just a few hungry mouths to feed. But I have seen untouched hives that have carried honey over from last year, swarmed, and will make it through this one without feeding. 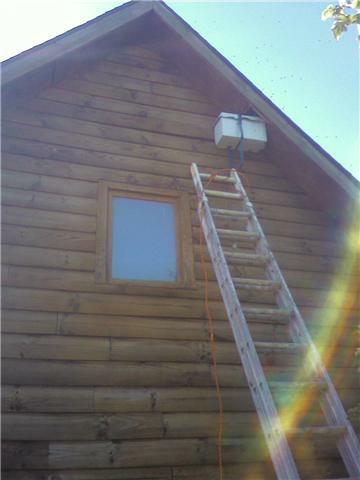 I continued doing some live bee removals - some interesting hives to add to the gene pool. In general, I think I’ll be controlling less, letting a few more swarms go. After four years of no treatments and seeing low low mite and disease levels, it’s time to let more hives grow up. My thanks to Dee. Beekeeping is an irrational activity. Perhaps this becomes clearest when watching grown people risk their lives crawling out on tree limbs to retrieve swarms. 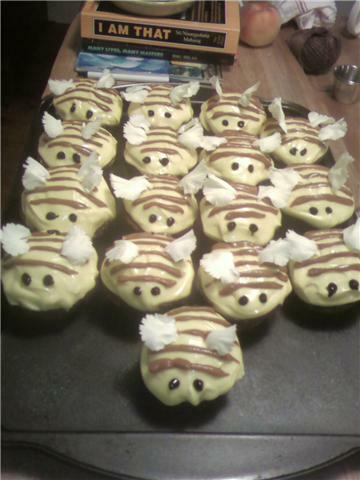 Not so immediately apparent are the daily, irrational struggles of running a bee business. The bees are up against a lot right now. Pesticides that don't show immediate effects, malnourishment from pervasive monoculture farming and lack of forage, and inbreeding from select industry interests. Add piss poor weather on top of that. The struggle is in staying calm under this sense of urgency. Humans are not rational beings. Love is not rational. Logic is the way of the machine and its state of order. Our school system is merely a battery charger for this machine. We are taught to quell our desires and become obedient and impotent. First you have a teacher, then you have a boss. You can join the legions of shoppers that drive this system, but efficiency does have its hidden costs. A major one being our country’s loss of the ability – even the knowledge - to feed itself. Another one being the permeating FEAR. Another one being the death of the pollinators. In school I was never taught the difference between a maple and an oak. Until I started keeping bees, I didn’t even know that these trees bloomed. I was taught to compete, accumulate, and be an alienated individual first and foremost. It becomes a lonely, degrading lifestyle for too many who go alone with it. There are of course exceptions, but the trends are not looking good. If it weren’t for bees and their bridge back to health and acceptance, I’d still be lost. Many I know have found similar paths now to join in solidarity. As friends in Ithaca organized a support group to the southwest this past month, I thought of the cultural appropriation of the Hopi and Navajo in Black Mesa, AZ, when their children were forced into white boarding schools for years at a time. Peabody Coal continues to strip away their culture and means of livelihood as well as the resources of their ancestral homeland. As we all go forward, we need positive alternatives to this appropriation. This year we saw proposals for applications of imidacloprid (IMD), a systemic pesticide shown in unbiased studies to harm honey bees, to maple trees (the most important and nutritious pollen in the northeast) on National Forest land in Massachusetts. The application of this long-lasting and understudied chemical is to combat the Asian Longhorn Beetle. If left unchecked, this beetle would likely destroy many trees, as the woolly adelgid is doing to the eastern hemlock, or the pine beetle to the Ponderosa in the northwest (a frequent scapegoat for the clearcuts). In a similar desperate act a century ago, the Forest Service cut down all the American Chestnuts as the blight spread. How many of those trees, the Redwoods of the East, would have shown resistance, as a few remaining do now? How long until the beetles and adelgids and who-knows-what develop resistance to the systemic pesticides and the government resorts to even more deadly poisons? As John Muir was losing the policy battle to protect our National Forest land from logging and development, he must have foreseen such problems. The theft of the forests’ nutrients, as well as air and water pollution, affect the immunity of the ecosystem, the superorganism. The insects are opportunists – just symptoms of these deeper causes. Like western medicine, like western science for that matter, we try to point a finger at a symptom, call it the cause, and then “nuc the enemy” with some kind of big band-aid to cover the cancer. The enemy is us. Duh. IMD is now banned in France, Italy, Germany, and Slovenia. Each country has studies that show its toxicity to honey bees. We know nothing of its effects on other pollinators. (We know frighteningly little about pollinators in general.) The so-called Environmental Protection Agency in the US has reviewed it and is not taking any action, but they do take funding from Bayer CropScience. Beekeepers everywhere are pissed. Many of us wrote to the EPA, to no avail. What can be done? For starters, do not use this product! Know what is being applied not only to your food but also your lawn and your pets. Do not use IMD or other systemic products such as Gaucho, Assail, Merit, or Advantage. What you choose to eat, buy, or use everyday is more important than any ballot or vote. The government won’t stop it; it is up to us to protect the bees as our forests fall into a deeper morass. Folks are listening to beekeepers these days. Let them know what’s up and how pissed off the bees are about it. Bee bold. When I travel through the Catskills, our own National Forest land, I can’t even find a free place to camp. I don’t ask anything from those hills. Some people with power are asking everything, even our clean water. It is worth fighting to prevent the horrible effects from the proposed natural gas drilling. Check out www.shaleshock.org. Think about the honey bees. They represent a wildness. Unlike the rest of agriculture, bees were untamed until about 150 years ago, when Langstroth came around. He had a neat idea and we learned a lot, but that knowledge has not led to wisdom. Bees still have this wildness under the surface of all these university, Haagen-Daas-funded breeding programs. They still have resilience despite organophosphate, essential oil, or formic acid exposure. 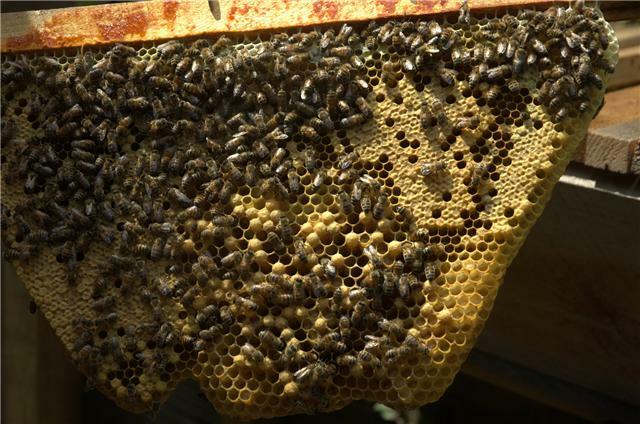 Consider raising your own local queen bees. Consider moving towards not putting dopes in your beehives. I’ll help you and share the steps that have liberated my bees from the rest of the industry and the artificial crutches. Sometimes (well, I guess all of the time), the EPA doesn’t listen. Sometimes it never stops raining. It can start looking pretty bleak. Yet we have so many weapons. One I’ve picked up lately is planting trees. Locusts, lindens, willows, and oaks. As well as apples, plums, and paw paws. I started a living bridge over a creek in one bee yard. I have a vision of providing a sapling with each bee hive bartered. My farmer friend Cliff Middleton has 5 acres in Miami-Dade county in Florida. The amount of regenerating food grown on that 5 acres- the longans, lichi, bananas, etc., but especially the tubers like the cassava and bonianta- could feed 100 people FOREVER. Cliff works a lot with kids, asking first, “What is the most important thing people do?” Sooner or later... eventually, growing food comes up. He then has everyone make two lists: one being everything you use, buy, eat, and throw away, the other list being everything you grow, nurture, give, and create. Generally, the first list is so long, the second one isn’t even gotten around to. What’s on your lists? As Cliff points out, the one group of people in the US who do have it the other way around are migrant workers, the most underpraised people who provide for everyone else's list. Read Cliff’s book “Hard Seed” at www.homegrowngreens.com. What we can teach the kids is everything. Experience a farm. Let them know they have the right to tend to and protect the land where they live. They can make their own decisions. Their happiness is most important, and happiness doesn’t come from taking things from other people but by giving. Don’t have any kids? Well, as it turns out, all kids are our joint responsibility. We can turn it around in just one generation. We have to. This is evolution. It is great to bee alive. As the waves of reflection wash away the anguish of this year, I’ll be finding that sought-after zen, redoing this entire website, editing some great new video footage, working on some articles and the 2010 Anarchy Apiaries Almanac. (Those of you who have ordered it, please bee patient, it’s on its way!) I’ve also promised for a few years now to put up the dimensions of the top bar hives, which I still need to measure. 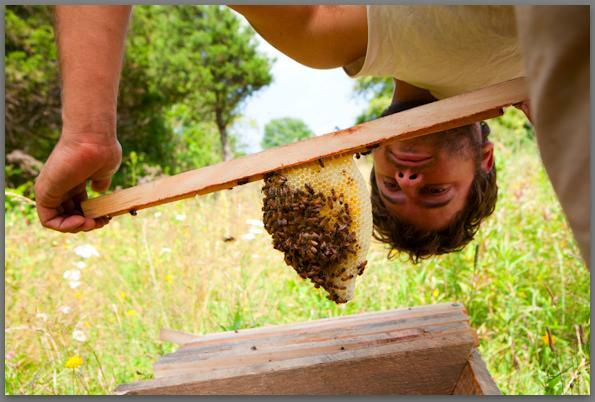 I’ll also be sharing with you an idea for the "Anarchy Hive," which may or may not be totally legal. For right now, I'm busy gluing in 16,000 popsicle sticks. Keep posted, as I’ll be doing some talks up and down the east coast this winter. Hope to see you there and that it gets rowdy.